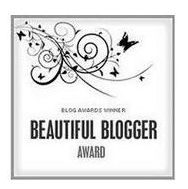 Thank you to KarenD of Frazzle and Aniploish for tagging me with the Beautiful Blogger award. 2) I have one little boy who loves to commandeer the computer from me to watch Mater's Tall Tales on YouTube. 4) 3 years ago I lost 55 pounds and I've managed to keep it off! That also marked my first forays (since early high school) into growing out my nails, and putting on makeup and feeling pretty again. I'm hooked! 6) I love to cook, mostly soups from scratch, but I enjoy baking my own bread and have even experienced grinding my own flour which is AhhhMAZing! 7) I suffer from eczema especially on my hands and fingertips, which can be a real pain when I'm trying to make blog posts about my nails. :( But I try very hard to keep my hands clear and am always interested in other people's solutions! I'll post 7 blogs and if you haven't checked them out I hope you will, but if I have tagged you, please don't feel obligated to pass it along! I just want to encourage people to check out new blogs! I'm amazed at the amount of us polish junkies and unique nail blogs! I was also tagged by Polish Freshie for the Unknown Blogger award! Thank you! 1. When and how did you start your love for polish? I started french tipping my nails after I lost a bunch f weight as a part of my feel better about myself plan. A friend gave me a bunch of wicked colors before she made a big move then she intorduced me to the Konad stamping system and I fell head over heels. Show my tapestries internationally! Travel europe and SEE some of the old tapestries firsthand. 3. What's your favorite love story? The Phantom f the Opera! Dracula! Beauty and the Beast! Choose 3 - 5 Blogs you would like to tag and link them too. Leave them a comment on their blog that you've linked them. Okay thanks again for the tags girls! I hope my next post I'll get brave and finally figure out how to set up my first giveaway. 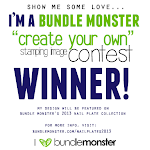 If anyone has suggestions for me in terms of what the EASIEST methods for a giveaway are please leave me a note? I'm wondering how I go about confirming followers and I'm wondering where I go to get one of those nifty forms. Big congratulations on maintaining your weight loss! I know how tough that is (from failing at it myself, but I'll keep trying). BUT! My best advice for that? Ask your doctor for a prescription for ectosone.. You will not regret it! Any time I have a flair up, I use it at night (sometimes with my gloves.. yeah, I use those..) and when I wake up, eczema free hands! Yay!